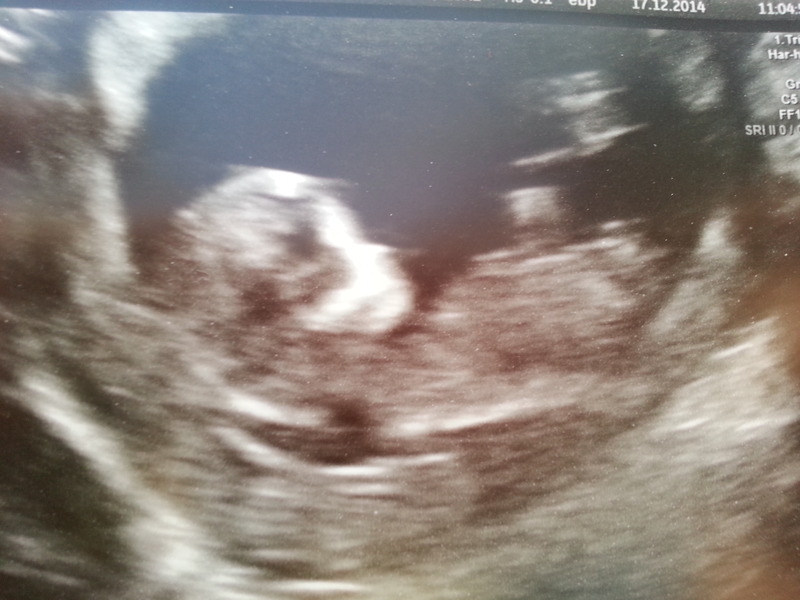 17 December 2014 – a very exciting day for us as we went for our first scan! I was pretty nervous about this day. Only a handful of people knew about our pregnancy as we wanted to keep it quiet until we’d had the first scan to make sure everything was ok with baby, and up until this point I hadn’t had many pregnancy symptoms, other than a little bit of nausea and feeling more tired than usual, so I didn’t really feel pregnant. Craig and I had both taken the morning off work, which in itself was difficult, as I’d had to tell people I had a hospital appointment and I’m sure my boss was suspicious about this! We arrived at the hospital, both feeling nervous, but for me my mind was taken off this a little by the fact I was bursting for the toilet! You are told to drink lots of water before the scan to get the best picture of the baby, and as someone who doesn’t really drink a lot, I was desperate for a wee! Luckily, we didn’t have to wait too long, and soon we were taken into the room for our scan. I hopped up on the bed and the nurse put the jelly on my belly. She did the checks she needed to, and then switched on the monitor above the bed so we could see our little baby. It was incredible. Seeing that first picture of our baby was amazing. I can’t even describe how I felt. Up until this point I hadn’t really believed I could be pregnant, it all felt like some surreal dream. But there it was. A little piece of me and Craig, jumping round my belly like a little bean! It was crazy to see the baby moving on the screen but not being able to feel it in my belly. We laughed about how long its legs were, and amazed at the detail we could see – its little nose and lips, and arms and legs. It was such a special moment, seeing our first child on that screen, one that could never be repeated or fully appreciated by anyone expect my husband and I. The nurse took all the information she needed and informed us that baby was growing well, and had everything they would expect it to. She printed off a photo for us and sent us on our way! I, of course, immediately rushed to the toilet to empty my bladder! We had been given an estimated due date at our first midwife appointment, but this was changed at our scan to 29 June 2015. The countdown was on!